Sarthak Music new oriya film “Raja Jhia Sathe Heigala Bhaba” shooting started from 11th March. Arindam and Archita are the main hero & heroine of this movie. Sitaram Agrawal is producing the movie. Prem Anand is doing the music. Sudhansu Mohan Sahoo is the director. 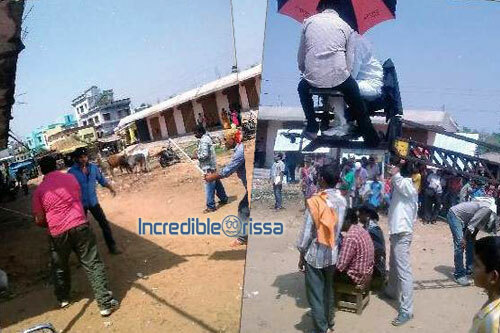 On Wednesday, shooting of a fight sequence from the movie took place at Biju Krusaka Bazaar. Arindam and some stunt men took part in this scene’s shooting. Arindam has not touched anyone of them, but the stuntmen are shouting in pain. How is it possible ? But this is the speciality of Arindam’s character in Raja Jhia Sathe Heigala Bhaba. Wait for Raja release of the movie!